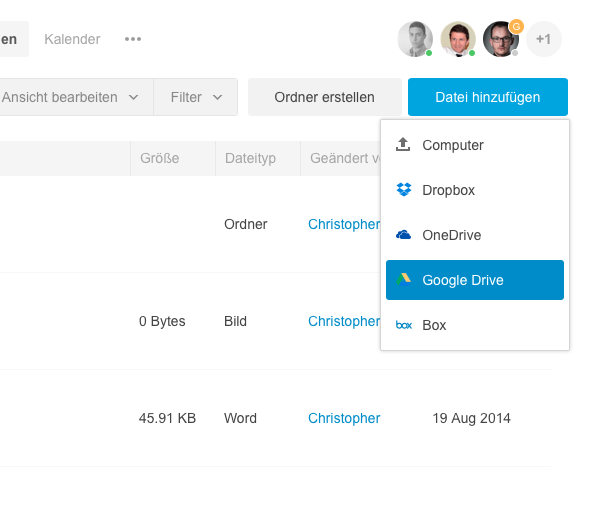 Besides the possibility to upload files directly from your computer, you are also able to add files from Dropbox, Box, One Drive or Google Drive to your rooms. In order to add Google Docs, you need to choose "Google Drive" as source. A Google Doc can be added by two different ways to a room. Firstly, the Google Doc can be added within the communication module by clicking on the arrow-icon besides the text input field for the text messages. There you need to select "Google Drive". Adding a Google Doc within the communication module. Then a new window will be openend, where you need to enter your login data of your Google account. Afterwards you can choose and add the needed file. It's also possible to add Google Docs within the file module. 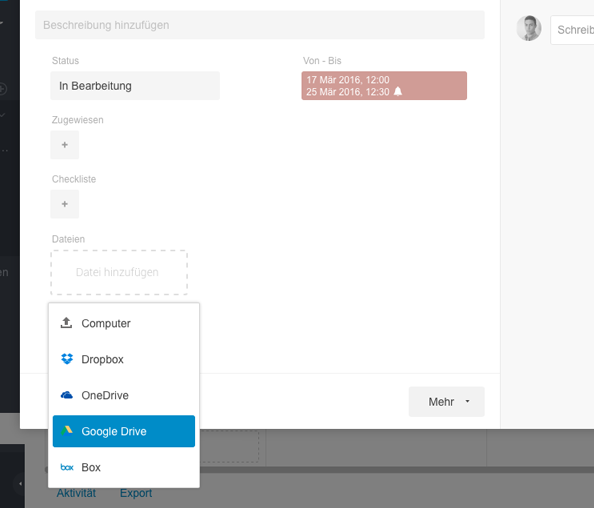 Here you need to click on the button "Add File", where also "Google Drive" must be selected. 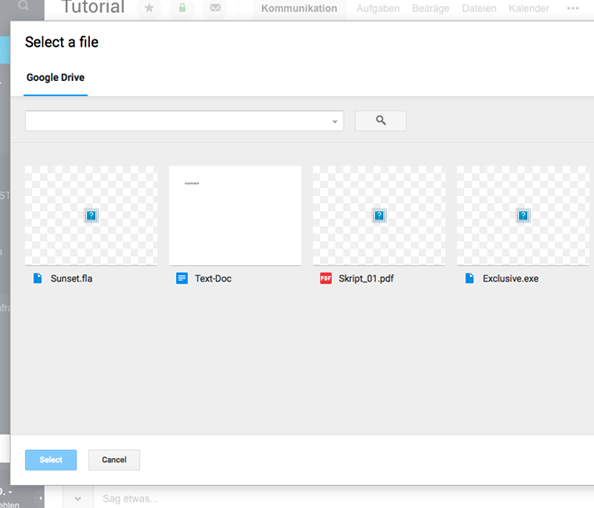 Adding a Google Doc within the files module. A Google Docs can also be attached to Tasks and Posts. 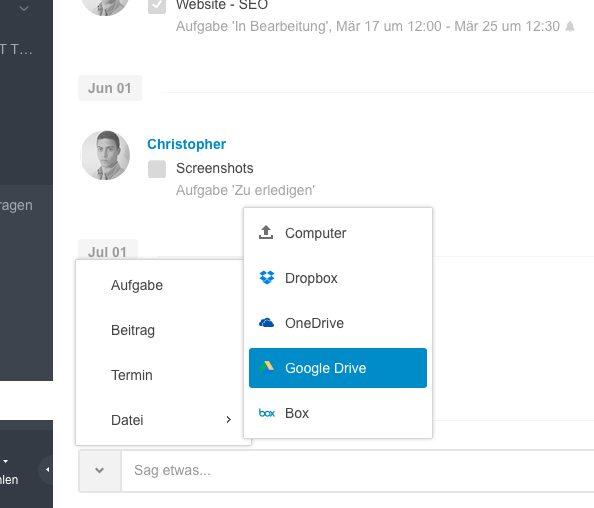 In order to do that, open a Tasks / Post and click on the button "Add File", and select "Google Drive". A new window within Stackfield will be opened, which enables you to select the needed file, which will be attached to the Tasks / Post. Attaching a Google Doc to a Task.